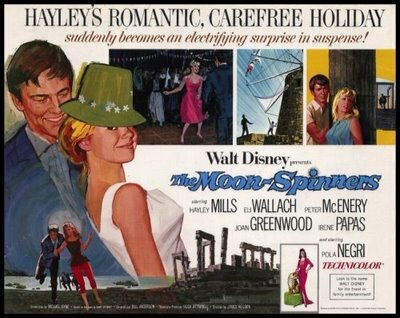 I didn't set out to have a Mills Family Night, but as it happened, I began the evening watching a John Mills movie and ended it with his daughter Hayley, starring in Disney's THE MOON-SPINNERS. 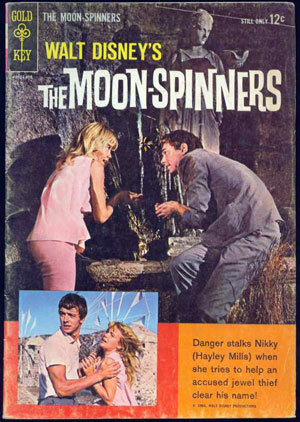 THE MOON-SPINNERS is based on a novel by suspense writer Mary Stewart, which is still in print today. 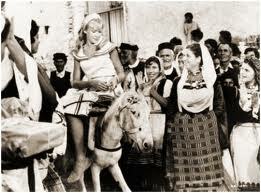 Hayley plays Nikky Ferris, who arrives in Crete with her aunt Fran (Joan Greenwood). Strangely, they're not welcomed with open arms at their hotel, where there's plenty of mysterious goings-on involving fellow British guest Mark (Peter McEnery) and Stratos (Eli Wallach), the brother of hotel owner Sophia (Irene Papas). When Mark is shot in the arm, Nikky helps him, and Mark eventually confides what's going on to Nikky. Mark and Nikky have to find a way to stay alive and solve Mark's problem in the process. THE MOON-SPINNERS is sort of Disney meets Hitchcock lite -- there's even a scary windmill sequence, shades of FOREIGN CORRESPONDENT (1940). The movie is a bit more adult than some Disney films of the era; for instance, the villains of the film are not cartoon figures, but lethal men who fully intend to commit murder. The movie meanders around a bit, running a tad long at 119 minutes, but it's pleasant company, with many positive attributes. First and foremost, of course, is the charming Hayley, a blossoming young lady who embraces adventure while traveling with her aunt. Some of her expressions and reactions are absolutely delightful. 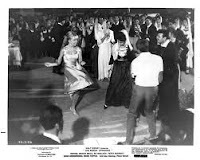 Hayley, who was 18 when this film was released, receives what's said to be her first onscreen kiss in the film. Hayley also has a fantastic wardrobe, described in detail by Kay at Movie Star Makeover. The film's costumes were designed by Anthony Mendleson. Hayley's dresses are just part of the movie's great look. Much of the film was shot on Crete, a unique and eye-catching setting. (Last fall there was a terrific article on the movie's location shooting posted at D23.) The traditional dances and local music being studied by Aunt Fran add to the film's atmosphere. Unfortunately some of the scenes are marred by the insertion of closeups with fake backgrounds, but the actual location shooting is really beautiful. The film's climax takes place on a yacht owned by a wealthy potential buyer of stolen jewels. Pola Negri plays the woman with an amusing light touch, belying the fact that the former silent screen star had not made a movie in over two decades. A bit of fun related trivia: Andre Morell, who plays the yacht captain, was the husband of Joan Greenwood, who plays Hayley's aunt. 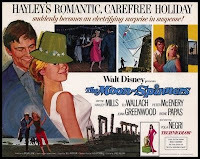 The movie was directed by James Neilson, who also directed Hayley in Disney's SUMMER MAGIC (1963). 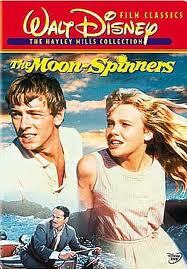 THE MOON-SPINNERS is available on DVD in Disney's Hayley Mills Collection. The DVD can be rented from Netflix. It's also had a release on VHS. It can also be rented for streaming from Amazon Instant Video. The bottom line: THE MOON-SPINNERS isn't top-tier Disney, but it's attractive, diverting entertainment which should be enjoyed by Hayley's many fans. I watched this movie a lot as a kid - I'd almost forgotten about it until I saw someone else mention it on Twitter a few weeks ago, and now you reviewing it! I remember being just young enough that the thrilling parts felt just on the verge of too scary for me - that feeling that maybe if my mom knew I was watching it, she wouldn't approve. Of course, she did, or I wouldn't have been watching it, but still. It felt a little more "adult" and dangerous than most of the stuff I'd seen up to that point. I'm curious now to go back and watch it again - see if it holds up. Loved your comments and the impressions you shared of seeing THE MOON-SPINNERS when you were younger, Jandy. I can definitely see it playing that way for a younger viewer. Would love to know how it holds up for you as an adult.